With the completion of a 1,000-kilometer urban greenbelt along the iconic Qiantang River, Hangzhou, Zhejiang province, is advancing toward its goal of becoming a green city. In January, the city government issued a blueprint of its urban development strategy, which features the protection and development of the river, the largest in the province and widely renowned for its spectacular tidal bore. 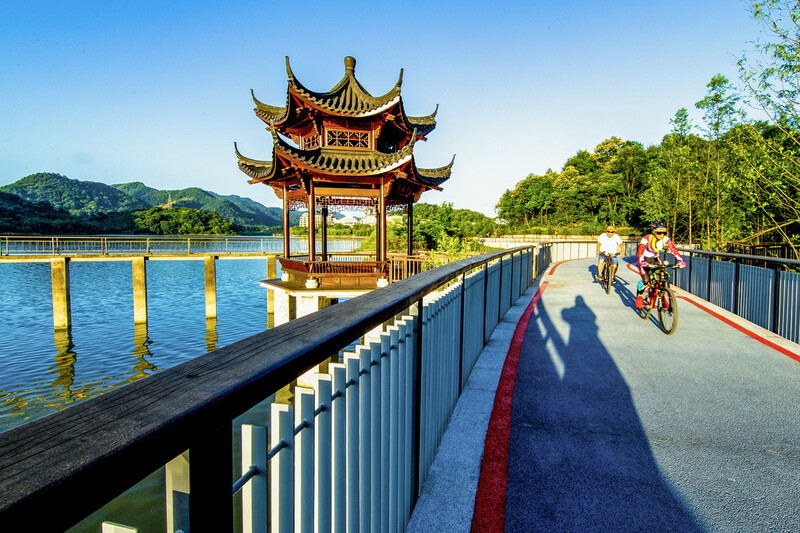 The blueprint shows that all greenways in the water system within the province will be linked by 2021, including the Qiantang, Fuchun and Xin'an rivers, as well as Thousand Island Lake. Altogether, the greenways will stretch more than 1,000 km, according to the city's housing and urban-rural development commission. It said the greenway plan takes into consideration the varied ecological resources of the Qiantang River system, and classifies the 1,000-km greenways into three categories - urban, riverside and mountain. Each category will be designed in harmony with relevant cultural elements to create a unique "greenness" experience for both residents and tourists. Meanwhile, transportation facilities will be added to make the greenways more accessible. One section, called the Jiulong greenway in Tonglu county, has become a national attraction, integrating farmland, fruit orchards, lake views and traditional Chinese style architecture. With more than 100 million yuan ($14.89 million) invested, the greenway spans six villages and stretches 15.8 km. The greenways have been paved with pebbles, colored concrete or wood. "I always bring my 9-year-old son here during springtime," said Ding Li, a resident of Hangzhou. "Here, he can embrace nature and enjoy cycling on the hilly greenway in a carefree way." Four stations have been set up along the greenway where tourists and cyclists can rest and enjoy local food at guesthouses run by nearby residents. The city will complete construction of a high-quality greenway network system by 2035, including all stretches and branches alongside the Qiantang River.